If you hold still, you may feel a particular energy here. Some people are very sensitive and may feel uncomfortable or uneasy. Others may feel shivers in their body or goose bumps. Still others may feel a very feminine, divine and peaceful energy here. Others may feel they are being watched. I can’t say that I’ve ever held still long enough to sense the energy here, but Iao is considered a powerful spot. Iao Needle formation in Iao Valley. Photo by Mark Fickett, from Wikipedia Creative Commons. I A O. Three vowels. They sound like “ee-yow” when you say them quickly. 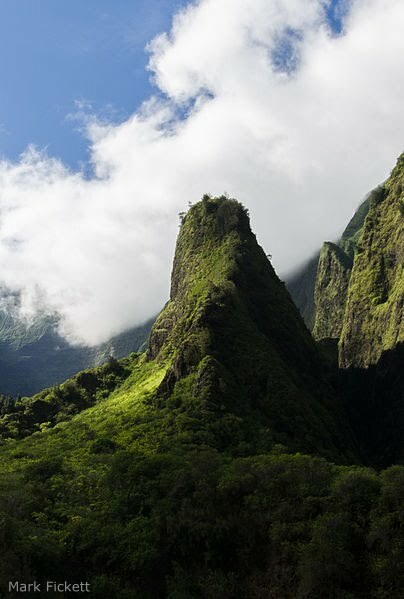 Iao gives its name to a valley, a stream, and a geological formation called Iao Needle. This area is a hiker’s paradise, with areas for swimming. It’s also dangerous when there are heavy rains, and the valley is prone to flash floods. This area of Maui, where Iao is located, is known for the origin of Na Wai Eha, The Four Great Waters of Maui. Long ago, Iao was the site of a major Hawaiian battle, when King Kamehemeha fought the warriors of Maui and won, thus adding another island under his rule. There was so much blood, the waters were said to have turned red. There were so many bodies that fell into the stream, that the flow of the water stopped. In caves dotting the cliffs overlooking the valley, the story goes, are hidden bones of royalty and chiefs. In ancient Hawaiian culture, bones are believed to contain the power of the person to whom they once belonged. Whoever possesses the dead person’s bones can access their power. So bones were hidden very carefully, so carefully, that the servant bidden to hide the bones was expected to kill himself afterwards, so that no one would ever be able to find them. Iao was also a place of peace. For centuries, Iao was the place on Maui where the Makahiki was celebrated. The Makahiki was a time of harvest, celebration and peace, and the beginning of the New Year in old Hawaii. So, if you feel energy here, whether discomfort, or peace, you may be channeling the energy from long ago. You may also enjoy: Herb Walk with David Bruce Leonard, Iao Valley.